Picture Day went well and I managed to have both girls photographed together as well. I'm excited to get the e-mail to look at the pictures. I hope we can find a nice picture of them together to give away for Christmas. After daycare we drove to the bath house to pick up a swimsuit Isabel had forgotten on Sunday when she was there for a party and then we fetched Rickard at work. 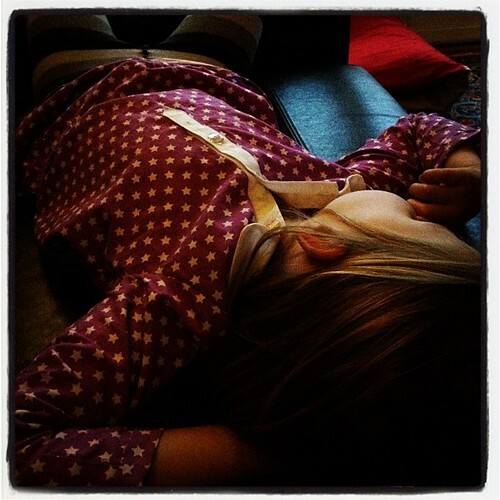 After a quick dinner Sofia splayed out on the sofa and watched Bolibompa (like Cbeebies only in Swedish). This is how tired you get after a full day of daycare. She wasn't asleep here but almost. Today school is closed for planning so Rickard took the day off to be home with Isabel and as a result Sofia has to stay home too. I think they'll have a great time, even if it is raining. Could I wear this to work?